Modern and traditional devices work with the speaker thanks to Bluetooth or wired connections that include 3.5mm AUX input and RCA AUX. With everything you need for a quick and easy setup, upgrading to an amazing home theater experience has never been easier-plug the Sound Bar in, connect it to your TV, sit back and enjoy. A sound bar adds a modern and exciting touch to any home, elevating your standard living room into a personal theatre system so you'll never watch a film anywhere else. 36'' ultra-slim Sound Bars are designed to blend in with a wide variety of placement options,easily fits with any 32'' + Class TV. 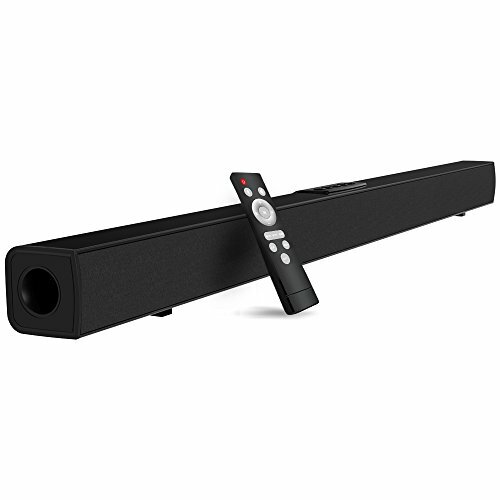 LOUD AND DYNAMIC SOUND : Emitting a versatile range of sound, the Sound Bar provides a sleek and dynamic sound in stunning compact designs. It also adds a cinematic quality to your existing system as it produces deep bass by 4 powerful speakers. MULTI CONNECTION WITH OPTICAL: The sound bar Built with more than one way of connection (Optical audio, L/R RCA jacks and 3.5mm stereo jack), sound bar can also be connected to a variety of devices from you phone, tablet, TVs via bluetooth function, fit for most old TVs and smart TV. If you have any questions about this product by meidong, contact us by completing and submitting the form below. If you are looking for a specif part number, please include it with your message.